Mars joins the Perseid meteor shower for a beautiful display on August 12th. The source of the shower is Comet Swift-Tuttle. Although the comet is nowhere near Earth, the comet's wide tail does intersect Earth's orbit. We glide through it every year in July and August. Tiny bits of comet dust hit Earth's atmosphere traveling 132,000 mph. At that speed, even a tiny smidgen of dust makes a vivid streak of light--a meteor--when it disintegrates. The shower is most intense when Earth is in the dustiest part of the tail.
. Between 2 a.m. and dawn on August 12th, if you get away from city lights, you could see hundreds of meteors. Scouts, this is a good time to go camping! Really, it could hardly be better. The Perseids come on a warm summer night. (Note: This is a northern hemisphere shower.) Other familiar meteor showers like the Leonids of November require a parka to enjoy. All you need for Perseids are light pajamas. And there's a bonus: Mars. In the constellation Aries, right beside Perseus, Mars is shining like a bright red star. Step outside before sunrise, look east, and you'll find you have a hard time taking your eyes off Mars. There's something bewitching about it, maybe the red color or perhaps the fact that it doesn't twinkle like a true star. It's steady. You stare at Mars and it stares right back. Earth and Mars are converging for a close encounter on October 30th. Consider August 12th a preview. Mars already outshines every star in the night sky, and it's getting brighter every night. If you like August, you'll love October. And you will like August. Picture this: It's four in the morning. The sky is dark. The breeze is pleasant. Mars is beaming down from the east while meteors flit across the sky. Maybe you should go circle the calendar again. 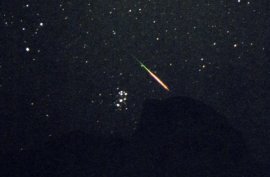 Editor's Notes: (1) The Perseids are a northern hemisphere meteor shower. Southerners can see Perseids, too, but at greatly reduced rates. (2) All times mentioned in this story are local, so, e.g., "2 a.m." means 2 o'clock in the morning in your time zone. Periodic Comet Swift-Tuttle -- (APOD) Comet Swift-Tuttle is the largest object known to make repeated passes near the Earth. 3D Orbit -- (JPL) view the orbit of comet Swift-Tuttle from any angle, and find out where the comet is now. What about the comet that's supposed to hit the Earth in 130 years? -- (Astronomical Society of the Pacific) Years ago, astronomers wondered if comet Swift-Tuttle might one day collide with Earth.